How to Use Joda Time in Eclipse? Joda Time is another very useful library for your Android application development. It provides a quality library of classes to replace the Java JDK Date and Time classes. 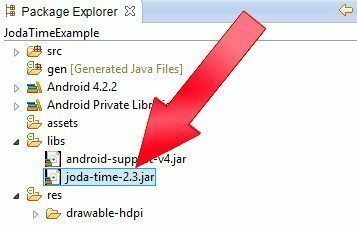 This post is generally about how to import a library in eclipse for Android development, we just choose Joda Time library as a good example. Every time I have a post instructing to install a library, I’ll probably link into this post. Ok, back to our main topic. Step 1: Download the latest version of Joda Time. Download joda time in source forge. Step 2: Extract the ZIP and find the JAR file. Files included in the zip. Step 3,: Copy to JAR file to your project’s libs folder. > and then Ctrl+V (paste) it there. Step 4: Add the JAR file to your build path. Step 5: Test. You can have the following code on your sample project to see if it works. As for some pros and cons of using Joda Time, see Jon’s answer here. Since Joda Time is another API to learn, you’ll need more examples codes, here are some few hundred Joda Time code examples. https://www.codeofaninja.com/wp-content/uploads/2016/06/codeofaninja-logo-100x100-op-80x80.png 0 0 Mike Dalisay https://www.codeofaninja.com/wp-content/uploads/2016/06/codeofaninja-logo-100x100-op-80x80.png Mike Dalisay2013-08-30 15:26:002016-11-22 09:24:30How to Use Joda Time in Eclipse?